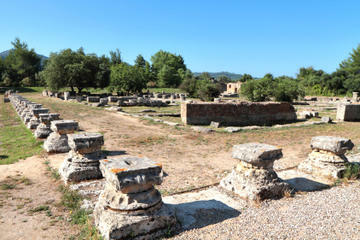 When you arrive in the Katakolon port, discover part of ancient Greece on a private shore excursion to Olympia. Learn about the origins of the Olympic Games as you visit the site of the former Olympic complex with your private guide. Walk around the remains of the first-ever Olympic stadium, the gymnasium, the Temple of Zeus and other ancient landmarks at the World Heritage-listed Archaeological Site of Olympia and the Archaeological Museum of Olympia. Then see how todays locals live in modern Olympia as you enjoy free time to explore the city. While your cruise ship sits in port in Katakolon, embark on a journey to ancient Greece on this private shore excursion to Olympia. Relax in a comfortable, air-conditioned private vehicle while your private tour guide shares interesting historical facts about the region. In Olympia, walk around 2,000-year-old monuments and buildings, and imagine the splendor of ancient Olympia, described as the most beautiful place in Greece by the Greek orator Lysias, who was famous for his speeches circa 400 BC. With your private guide, visit the Archaeological Site of Olympia, a UNESCO World Heritage Site, where numerous exhibits are on display. Marvel at the ruins of the Temple of Zeus, which once housed the gold and ivory statue of Zeus, one of the Seven Wonders of the Ancient World. See the remains of the first Olympic stadium, the gymnasium, the Palaestra and the Heraeon (also known as the Temple of Hera), the oldest temple in Olympia. Discover the beginnings of the Olympic Games at the Archaeological Museum before heading off to modern Olympia. Enjoy an hour of free time in the city to explore or get a snack before you return to the Katakolon port. We will ensure your timely return to the Katakolon port for this activity. In the rare event your ship has departed, we will arrange for transportation to the next port-of-call. If your ship is delayed and you are unable to attend this activity, your money will be refunded. See our terms and conditions for full details. Wir würden uns freuen, Ihnen bei Ihre Reiseplanung helfen zu dürfen.